I am a huge fan of adventure stories involving a small group of people on a quest or mission. This is probably something ingrained in my personality from my early exposure to The Lord of the Rings (in particular, The Fellowship of the Ring). There is something about the idea of a small team of specialists, each with a unique skill, that always fires my imagination, and you can see the concept appearing in my own books all the time. 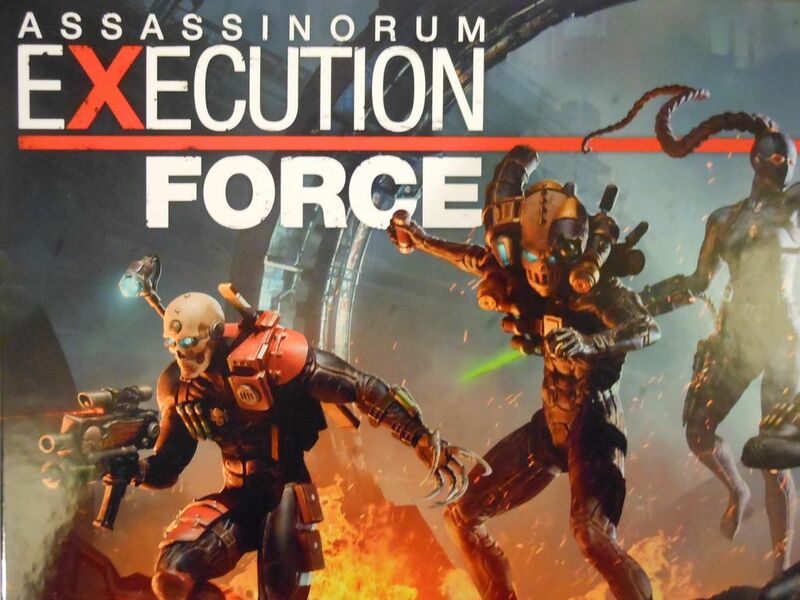 That being the case, Assassinorum: Execution Force was always going to be of interest. It's a game about a group of four assassins infiltrating a chaos base to slay a sorcerer. What makes it really interesting is that each assassin has a different style, and a different load-out of equipment to achieve the kill. Studying the skills and equipment, and planning optimal strategies, is fascinating for me. So, I thought I would shine a bit of a spotlight on each of the assassins in the game, just to discuss what they can do, and what I find interesting about them. Note for those who don't know: Each assassin has a basic ranged and close assault attack. two always-on abilities, one Primaris Tactic with three uses, and one Omegon Tactic with a single use. Assassin's get to do two different actions and one Tactic every turn. Whenever you attack, you roll a number of dice and add modifiers, if any one dice is equal to the target's resistance rating then you inflict a single wound. Normally, one wound is the best you can hope for in a single attack. First up is the Vindicare, who is probably the most traditional of the assassins, and my favourite. He is armed with high-powered long range weaponry, and specialises in killing at a safe distance. His base ranged attack is 1D6+1, and his close combat attack is a pathetic 1D6. Out of the gate, those low combat values make him the weakest of the assassins, and his skill set does not do a huge amount to improve his lot. His first "always on" ability is "Deadshot," which significantly boosts his ranged attack. If he has not moved prior to shooting, he has infinite range with his rifle, gets an additional +1 to hit (1D6+2), and causes two wounds instead of one. The problem is, "Deadshot" is a very situational ability, as you have to be able to take your shot with the first action of your turn. That means you have to always think a turn ahead, positioning your Vindicare now so he can take his shot later. This relies heavily on cultists wandering into your field of fire, and takes careful planning. Fortunately, the Vindicare's second "always on" ability, "Stealth Suit," helps with positioning, as it means he is hidden in plain sight as long as he is more than six squares from any renegades that would normally be able to see him. Interesting side note: According to the rules, models cannot see spaces beyond another model and there is no exception for the Vindicare, even with his "Stealth Suit." That means you can actually block line of sight to your allies by standing in front of them, which is a neat little trick if you can pull it off. If you get the positioning right, you are pretty much guaranteed to kill a cultists (requiring a 2+ to kill), and you can even total a space marine in a single turn thanks to the double damage. In fact, the Vindicare is the only assassin with the ability to kill a space marine with a single action. It is also worth noting that there is nothing stopping the Vindicare from moving after he has used his "Deadshot" ability. 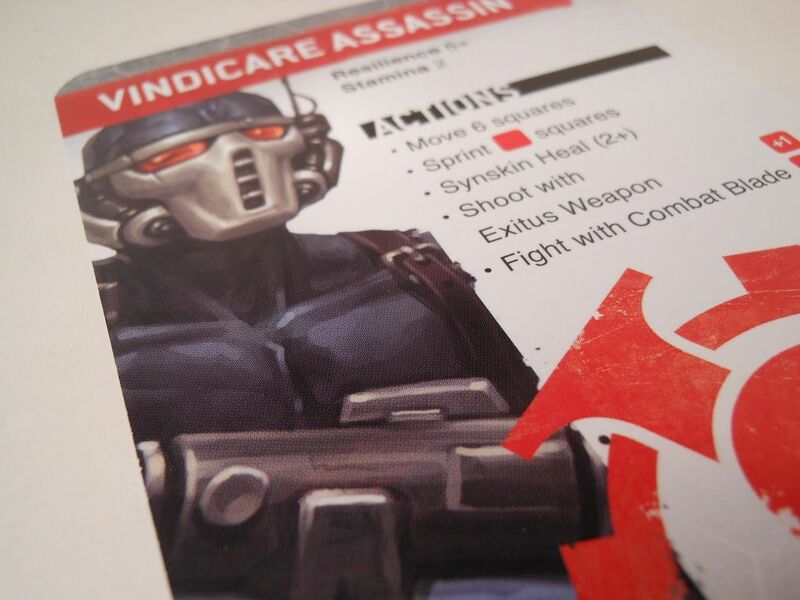 However, the difficulty in pulling off "Deadshot," and the fact his basic attacks are so poor, means the Vindicare feels significantly weaker than the other assassins, and is not the character to give to a beginner or younger player. The Vindicare's Primaris Tactic, "Exitus Ammo," is a basic re-roll when failing to hit at range. This can be used with a basic attack or a "Deadshot" attack, and ideally you want to save the re-rolls for when you absolutely, positively have to take off a space marine's head (or whack double damage on Drask). His Omegon Tactic is "Blind Grenades," the chance to automatically stun a Renegade within six squares, and all other assassin's adjacent to that target. Stunned Renegades don't get to act on their next turn, but afterwards they immediately go on alert and become a more serious threat. That makes this a kind of last-gasp ability to get you out of a really tricky situation. 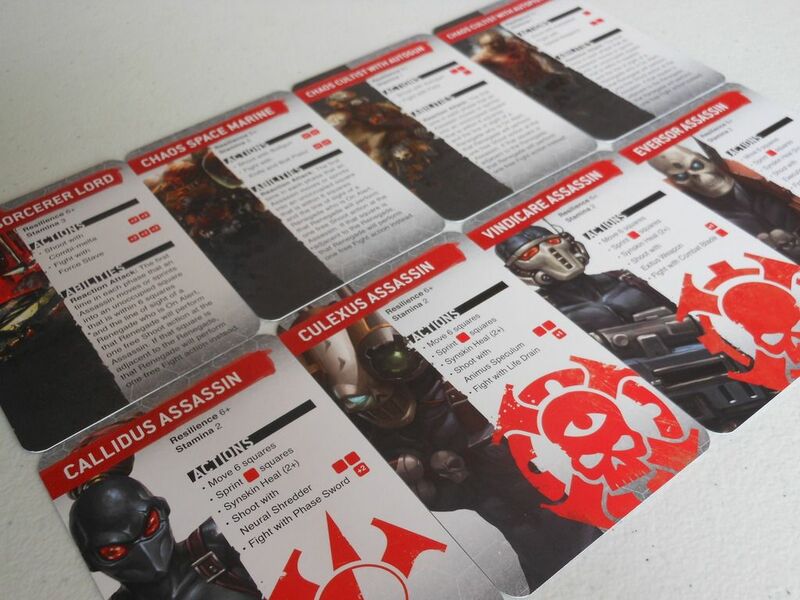 Not having to roll for success is very powerful though, especially if the Renegades were already on alert, as you can stun them to reduce the number of event cards you have to draw in the Chaos phase (stunned renegades are no longer considered to be on alert). Verdict: Cool model, cool idea, but difficult to work with. The Vindicare needs to study the patrol routes, and position himself correctly. Stick him at the end of a long corridor, and watch as he takes the heads off renegades every turn. He doesn't get to run around much, and is unlikely to have the speed or kill-power to go it alone on a solo mission. His chances of killing Drask on his own are quite remote unless he still has his "Blind Grenades," which effectively gives him two rounds of shooting before he gets chewed up and spat out. Just remember, you cannot throw the grenades and get a re-roll on your ranged attack in the same turn. Give this assassin to the pro player who likes a challenge, and can think ahead. The Vindicare is all about slow movement, careful positioning, and attacking at range; the Callidus is pretty much the opposite, focusing on swift movement and exploration. Her basic ranged attack is 2D6, and her close assault attack is 1D6+2, making her a good all-round fighter who prefers to get up close and personal if possible, especially since her Primaris Tactic, "Poison Blades," allows her to re-roll failed close combat rolls. Her always-on abilities are geared around movement, with "Acrobatic" allowing her to move through enemies, and "Hit and Run" allowing her to make a free movement 1D6 squares following a close combat attack. These two abilities mean she can really move when she wants to, getting out of tight situations where other assassins would be pinned, and accessing remote locations rapidly. "Hit and Run" is excellent, but it should be thought of as an additional free move rather than a safety net for when a combat goes wrong. This is because 1D6 movement does not guarantee her safety following a failed attack. Her target will be on alert, and will shoot at her, or run her down, in the following Chaos phase. Her Omegon Tactic is "Polymorphine," which at first I thought was overpowered, but is actually rarely very useful. When she activates it, renegades basically start ignoring her, as they just see one of their allies in her place. When I first read this ability, I misread it that the effects last until she fights or shoots, leading me to believe it was a broken ability. She could effectively activate the ability, wander around the map revealing locations without raising the alarm, and then sit back and smoke a cigarette while her allies teleported into Drask's sanctum and kicked the living doodles out of him. However, the "Polymorphine" actually only lasts until she fights, shoots, or (importantly) makes a normal move. Effectively, all she can do while disguised is Sprint 1D6 squares per turn, and as she cannot do the same action twice, that really limits her usefulness. Basically, she has to dawdle, mimicking the slow, methodical movements of the renegades on patrol, meaning she doesn't have the ability to dash around looking for objectives. This changes "Polymorphine" from a way of almost guaranteeing a win to a very situational ability that could save you when nearby enemies would raise the alarm during the Chaos turn. It is unlikely you will stay morphed for more than a turn, really. It is worth noting that there is no restriction on when you can use "Polymorphine," so you could be standing right in front of a renegade and still use it. You could even punch a cultist in the face before activating the "Polymorphine," and the dozy eejit still wouldn't retaliate. 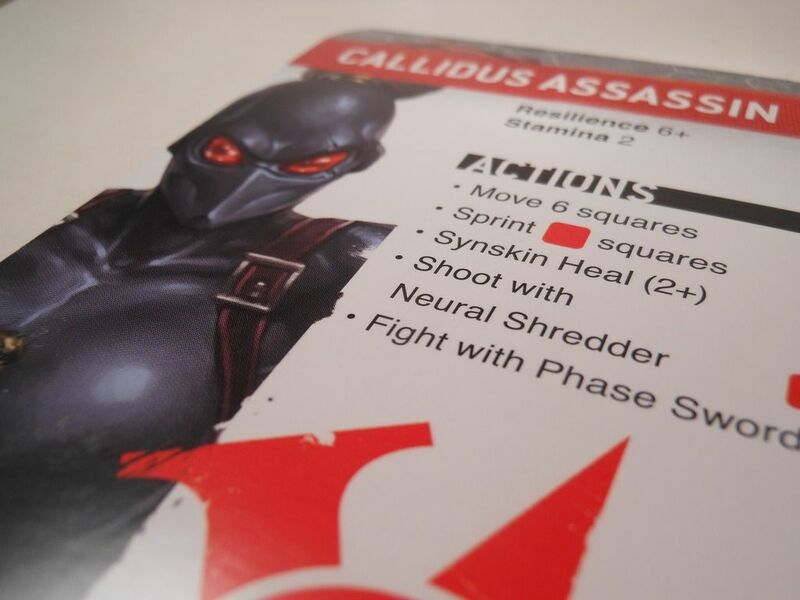 Verdict: Fast, with good close combat capabilities, the Callidus is a bit of a work horse. Her primary goal should be revealing rooms, especially as she has the option to move into line of sight, close assault any renegades she finds, and then skedaddle 1D6 spaces into cover. She is going to prefer being in close, but if she gets caught out, she is very fragile (having the weakest defensive options of the three assassins that favour close quarters combat), so there is a risk she overstretches herself exploring, becoming isolated and vulnerable. She works really well in association with the Eversor - she opens up the room, and he opens up the occupants. The Culexus is an odd beast, with abilities that trigger reactively, and crowd control tactics. His basic attacks are 2D6 at range, and 1D6+1 in close assault, making him a slightly inferior version of the Callidus in terms of combat prowess. However, his abilities significantly improve his chances of winning... if they trigger. First, he has the always-on ability of "Etherium," which prevents renegades from modifying the values of their attack dice when they attack him. In other words, he only ever gets hit on the roll of a 6. I'm not good at stats, so I'm not sure if this is better or worse than the Eversor's 5+ save. I mean, space marines attack with 2D6, getting +2 modifiers on each roll, and need a 6 to hit. So, is it better to face 2D6+2 with a 5+ chance to save if you get hit, or is it better to face 2D6 with no chance to save? His second always-on ability is my least favourite in the game, because it only ever triggers when you pull a "psychic" event card in the Chaos phase. The Culexus gets to ignore the effects of any such cards. Furthermore, on the following turn, he gets to re-roll whiffed attacks made at range. This is actually an ability that penalises you for being stealthy. Less alerted guards means less events, which means less chance of getting that re-roll ability. That's an odd design choice. His Primaris Tactic is "Psyk-out Grenades," which allows you to stun a single model within 6 spaces on the roll of 4+. In general, this is pretty weak. It does not automatically work, and only stuns the target (subsequently putting them on alert). However, the grenades are more useful in the end game, as they will inflict a single wound on Drask, allowing the Culexus to inflict two wounds per turn on the Big Bad (TM). His Omegon Tactic is "Soul Horror," which is fairly similar to the Vindicare's "Blind Grenades." The difference is that the Culexus IS the grenade. He unleashes the "Soul Horror," and every renegade within 6 squares is stunned. This is better than the "Blind Grenades" as it has a further reach, but the downside is that the Culexus has to get into the thick of the action to get the most benefit as it is not a directional attack. It is a potential lifesaver during the endgame, as it is a big enough blast area to fill Drask's ceremonial chamber. If you are fighting Drask, and there are space marines piling in as well, the ability to stun all of them for a turn probably keeps you alive. Verdict: This is your crowd control unit. He can ignore a lot of bad events, and has the chance to stun enemies when the going gets tough. Unfortunately, one of his always-on abilities... well... it isn't always-on. However, he really comes into his own in the endgame, with the ability to take control of the situation and cause additional wounds with his grenades. Note that his psyk-grenades have a 50% chance of whiffing, so you probably want someone favoured by the Dice Gods to play this character. I'll be blunt, the Eversor is easily the best assassin in the game. He's stupidly killy, virtually indestructible, and gets so many actions he is a whirlwind of death. He can kill Drask in a single turn. On his own. His basic shoot action is the standard 2D6, but when he gets in close he is rolling 3D6. That is going to make mince meat of a cultist with resistance of 4+, and has a good chance of wounding a marine with a resistance of 5+. 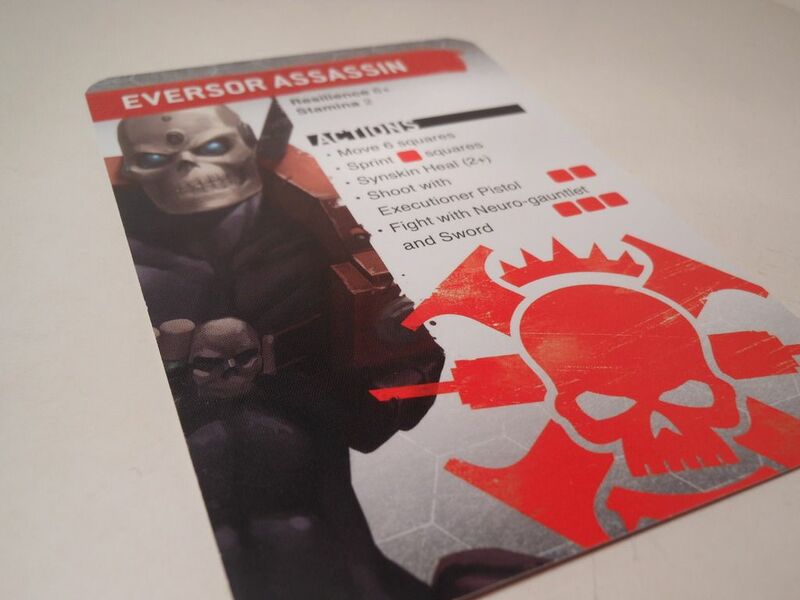 However, what makes the Eversor (dare I say it...) overpowered, is a beastly set of special abilities that also make him the ideal candidate for anyone who wants to achieve the "I work alone" mission, which pits a single assassin against the game. For a start, he has the always-on ability of "Hypermetabolism," that gives him a free 5+ save every time he takes a wound. That's 5+ for any type of wound, with no modifiers. Bear in mind that the maximum number of wounds an assassin can take from a single attack is one... That's a 33% chance of nullifying every single successful attack against him. Even attacks from Drask. And let's not forget, the bad guys need to roll a modified 6 to hit him in the first place. So, Mr Eversor is going to stick around for a while; but where he really shines is when he gets to start stabbing people back. His always-on ability of "Combat drugs" allows him to make the same action twice in a turn. Yup. That means he is the only assassin who can attack twice in a single turn. And that's with three dice per close combat attack, or two dice per ranged attack. Sure, the Vindicare can take a marine's head off from range with a single shot, but if the Eversor is up close and personal with that same marine, you are guaranteed to redecorate the room in a nifty shade of red. Two close combat attacks at 3D6 per attack is enough to kill one marine, or two cultists per turn; but the fun doesn't end there, because the Eversor has the Primarus Tactic "Frenzon," (no, not "Friend Zone," it's the opposite of that), which allows him to take a third action on his turn. So folks, why not kill two cultists in close combat, and then blast a third one at range? Or shoot the living beejeezus out of a space marine before slinking into the shadows? But, I know what you're thinking. You're thinking that, even with three actions, and being able to do the same action twice, it isn't possible to inflict the three wounds necessary to kill Drask. But the Eversor also has the Omegon Tactic,"Bio-meltdown." Basically, he blows himself up, causing a wound on every model within six squares on a 4+. So, it is possible to wound Drask twice with basic actions, and then to blow yourself up. Sure, you die; but if Drask dies too, you win by default. Verdict: Yup. The Eversor has it all. Use him for solo missions, use him for thinning out groups of enemies, use him for covering ground quickly, use him for killing heavy hitting enemies, use him for killing Drask. You get the picture. 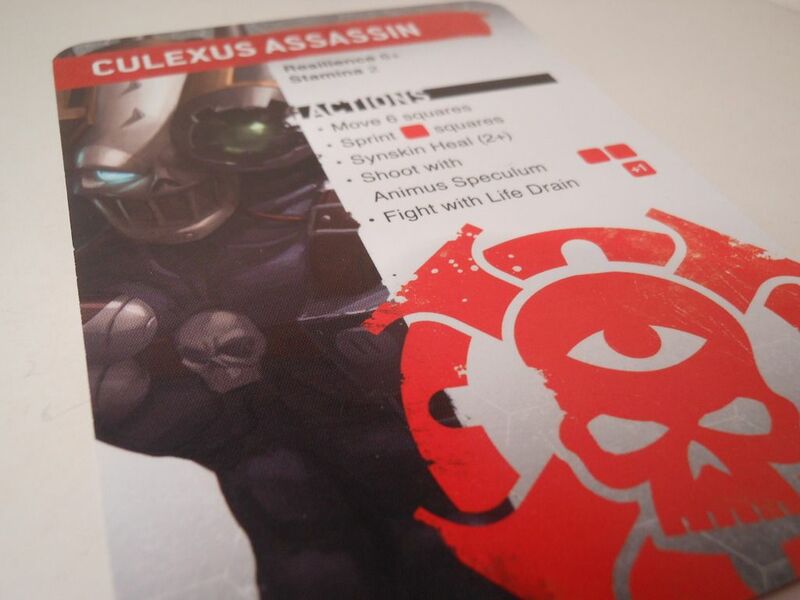 He is the ideal assassin for new players, as he is unlikely to die early, he is very forgiving of mistakes, has the ability to do loads of damage so the new player feels all involved and important, and has pretty straightforward tactics that involve running at people and screaming. He is also really, really fun. So, that's the whole gang. They are all very different, but they all have a part to play. The Vindicare feels a bit short-changed, the Eversor feels a bit overpowered; but they are on the same team, so it doesn't really matter. It is possible to get them all to gel together nicely: Callidus searches, Eversor sweeps, Vindicare lends covering fire and watches for patrols, and Culexus stands there looking a bit creepy until things turn ugly, at which point he suddenly springs into action, drawing power from the chaos of the situation. I'm impressed with how they all work together. The downside, of course, is that once you have formulated winning strategies, the game is going to get significantly easier to win. But it's never going to be a guaranteed win. The Dice Gods will make sure of that. Thanks for the tactical advice. I also found the eversor to be the most fun. I feel that I can rely on him to do what I need him to and he has so many interesting choices each turn whereas there's less choice with the other assassins. One of the things I really like about this game is how few tokens there are. I'm finding more and more that board games are including a bucket load of tokens (particularly fantasy flight games) and it's nice to see such a streamlined game with such a strong theme. These days, I much prefer the streamlined games that I can teach quickly. Games like Mansions of Madness have become a bit of a chore, but Space Hulk, Claustrophobia, and Assassinorum are all fine games that play almost effortlessly.